Grind pineapple pieces and pass through a strainer to get smooth pineapple pulp without any fiber. Take a microwave safe bowl and add the pineapple pulp and sugar and mix well. Place the bowl in microwave oven and cover the bowl partially. Cook the pineapple on high power for 7 minutes. Remove bowl from oven, stir the mixture and place the bowl in oven covering it partially. Cook the pineapple on high power for another 3 minutes. As cooking time differs from oven, depending on the capacity of the oven, cook till desired consistency is reached. 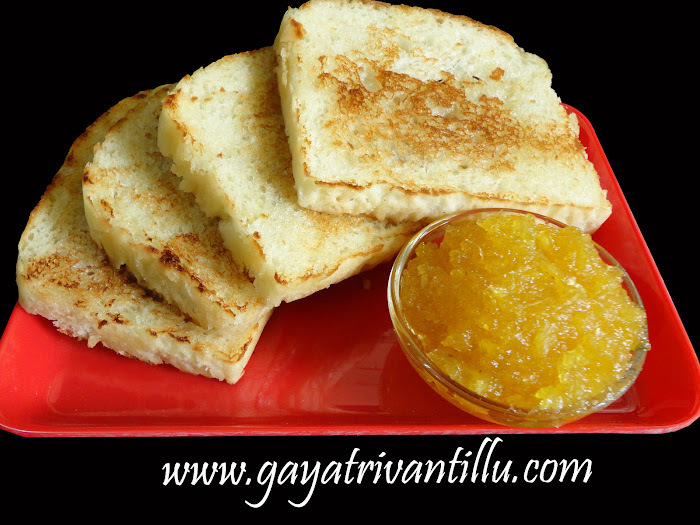 Use the fresh pineapple jam on hot toasts or spread on hot rotis or chapattis. Also use this jam to make delicious pineapple ice cream. With the measurements given above we get 125gms (1/3Cup) of fresh pineapple jam. As the quantity prepared is less no need to add any preservatives. Frozen pineapple pieces give best result. Cut pineapple into pieces and freeze them overnight. Next day thaw the pineapple pieces and use. Grind the pineapple pieces and strain to get smooth pulp without any fiber. If using the jam for spreading on toasts then do not strain the pulp as it does not affect while eating. Whereas if using the jam to make ice cream do strain the pulp and remove the fiber as the fiber spoils the taste of ice cream. To avoid any type of burns use mittens while removing and bowl from oven as the mixture would be bubbling. If needed the jam may also be prepared on a stove top. Take a wide pan and mix the pineapple pulp and sugar and cook on low flame stirring till the mixture thickens. Though it may take some time, cooking on low flame is advisable as we have some control to check the consistency required. Cooking on stove top requires constant watch and in between stirring the mixture is also a must otherwise the mixture may stick at the bottom of the pan and gets burnt. Also while cooking on a stove top the mixture splatters and spoils the surroundings and to avoid this one may need to cover the bowl partially. Also when the mixture splatters while cooking, it may fall on our hands causing burns. If microwave oven is not there then cook carefully on stove top only. 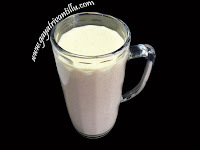 For the recipe I have not added any preservatives. As the quantity of jam made is less it doesn’t require any preservatives. I personally do not like to add any chemicals as far as possible—hence I make in small quantities and also with fresh ingredients. When we bring a pineapple use some to make jam and some to make juice and eat some pieces fresh. Serve the freshly prepared jam with toasted bread or spread on rotis and roll and serve or make ice cream to serve s dessert.